Lionel Messi has hinted he may finish his career in Argentina after extending his Barcelona contract to June 2018. The Argentina forward, 25, who has signed a two-year contract extension, enjoyed a record-breaking 2012 for club and country, scoring 91 goals. "I said it before - in Europe I'd like to end my career at Barca. I wouldn't consider moving to another European club," he told the club's website. "With that said, I'm not ruling out ending my playing career in Argentina." Messi signed a new deal on Thursday afternoon and follows Carles Puyol and Xavi, who both signed their extensions last month. Defender Puyol and midfielder Xavi agreed new deals until 2016. A statement on the Barcelona website said: "Leo Messi extended his contract with FC Barcelona through 30 June of 2018. 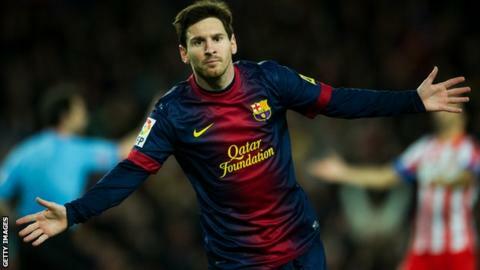 "Messi added two additional years to his existing contract, which was set to expire in June of 2016. "The player, who joined the club when he was 13 and made his first-team debut three years later, will be 31 when his contract expires." Barcelona are top of La Liga with a nine-point cushion over nearest rivals Atletico Madrid. They play the first leg of their last 16 tie in the Champions League away at AC Milan on 20 February. Messi has been in the best goal-scoring form of his career and surpassed Gerd Mueller's 40-year-old record of 85 goals scored in a calendar year with a brace in a 2-1 win over Real Betis on 9 December. Messi had agreed the contract at the end of last year but has only just signed it. He has scored eight times in Barcelona's first five La Liga matches of this calendar year, including four against Osasuna in a 5-1 win on 27 January. Last month he was awarded the Ballon d'Or for a fourth year running ahead of Barcelona team-mate Andres Iniesta and Cristiano Ronaldo of Real Madrid.